This beautiful, beautiful doll arrived today! My very first Waldorf doll! 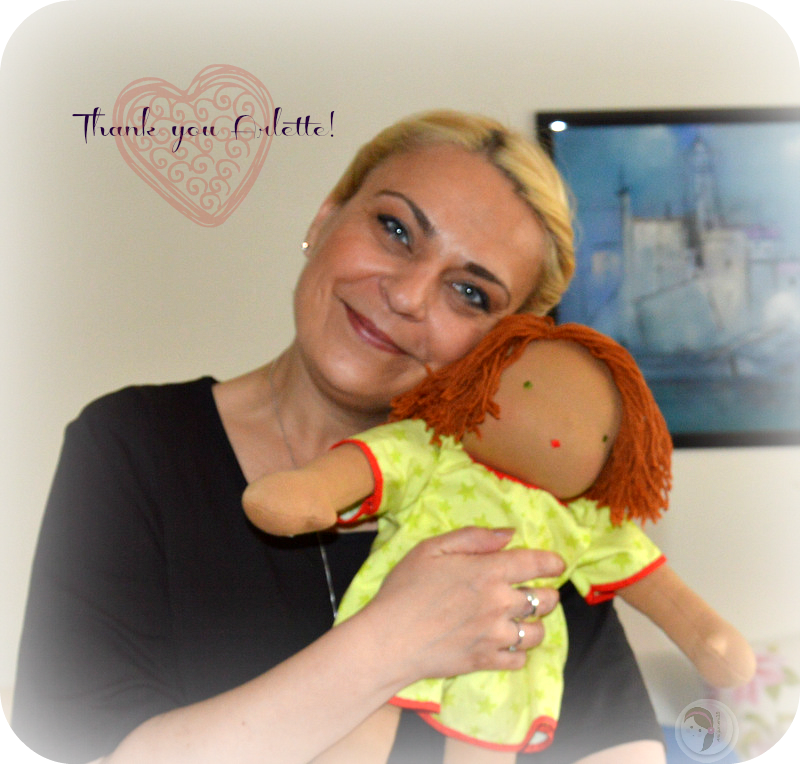 Eglantine is made by my very special and very dear blogger friend Arlette. Doll is completely sewed by hand and is really piece of art. Clean and firm work from head to toe! I am amazed how wonderfully doll is crafted. She came wearing soft overall baby PJ’s. Arlette sewed her adorable little dress as well. This dress my little Eglantine can wear when showing off to my friends and family. More about Eglantine’s clothes and how they’re done you can read at Arlette’s blog. For a long time I wished having real Waldorf doll. I am not good at machine sewing and wasn’t confident or brave enough to sew one by hand. When Arlette told me and showed me doll she made for me I was so excited. Fell in love with Eglantine at first sight. Today when the package arrived and when I saw her, I couldn’t stop hugging and cuddling her. She is sooooo beautiful! And I am sooooo happy! Thank you Arlette for wonderful gift. Can’t wait to make her few more outfits!!! But before I start making clothes for Eglantine, have to finish editing Maya the Bee pattern. This one is coming in day or two!